In addition to the candidate that eventually gets hired, the The Apprentice's new season will also feature two more of The Donald's "apprentices" -- adult children Ivanka and Donald Jr. Appearing in several of the new season's episodes, 24-year-old Ivanka and 27-year-old Donald Jr. will become the latest folks to fill in for regular The Apprentice co-stars Carolyn Kepcher and George Ross when The Trump Organization executives are busy with other Trump business. "It's triple the Trump this season on The Apprentice," gushed Trump. "I invited my children Don Jr. and Ivanka into the boardroom for several episodes this season and they take the firings to a whole new level." Like last season, this season's The Apprentice candidates were "handpicked" by Trump, who -- as he typically does every season -- is touting the cast as the show's best ever. "I once again hand-picked this season's 18 candidates and this group is as smart and likable as season four but even more entertaining," said Trump. Naturally, The Apprentice creator and executive producer Mark Burnett also agrees with his business partner. "Viewers clearly related to the cast of Season Four," added Burnett. "We received tremendous feedback about how smart, attractive and likeable they all were. The candidates on Season Five are cut from the same mold." 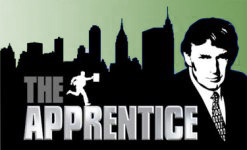 However, more so than previous casts, The Apprentice 5's contestants will also feature an international flavor, with the cast including candidates from England, Canada, and the former U.S.S.R. "They are brilliant -- including our first-ever MENSA member -- hungry and more international than ever," said Burnett. Ranging in age between 22 and 38, the cast includes a psychotherapist, an appellate attorney, a sticker company owner, and candidates boasting degrees from schools including Harvard, Columbia Northwestern and Cornell University.